If you're in the New York area I hope you will join me this fall for Mondays with Hitchcock. 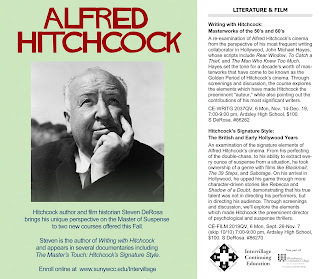 I've put together two programs for Westchester Community College, six sessions each, where we'll be screening and discussing scenes, sequences and films of Alfred Hitchcock. Each night will have its own theme, and some rare items will be screened as well, including a the silent version of Blackmail. An examination of the signature elements of Alfred Hitchcock’s cinema. From his perfecting of the double-chase, to his ability to extract every ounce of suspense from a situation, he took ownership of a genre with films like Blackmail, The 39 Steps, and Sabotage. On his arrival in Hollywood, he upped his game through more character-driven stories like Rebecca and Shadow of a Doubt, demonstrating that his true talent was not in directing his performers, but in directing his audience. Through screenings and discussion, we'll explore the elements which made Hitchcock the preeminent director of psychological and suspense thrillers. A re-examination of Alfred Hitchcock’s cinema from the perspective of his most frequent writing collaborator in Hollywood, John Michael Hayes, whose scripts include Rear Window, To Catch a Thief, and The Man Who Knew Too Much. Hayes set the tone for a decade’s worth of masterworks that have come to be known as the Golden Period of Hitchcock’s cinema. Through screenings and discussion, the course explores the elements which have made Hitchcock the preeminent “auteur,” while also pointing out the contributions of his most significant writers. Would love to hear more about Young and Innocent, since that's one of my faves. Too bad I missed this! Oh, darn it!